Sun smarts – Respect the sun’s strength, even on cloudy days. Wear a hat, use sunscreen (SPF 30 or higher) and take periodic shade breaks. LVHN Healthplatz tip: Not all of Musikfest’s fun is outdoors – check out a show in the ArtsQuest building on the South Side, make a stop inside the historic Hotel Bethlehem, or visit one of the many locally owned shops along Main Street to cool down and take a sun break. Sip and slurp – Don’t wait to drink water until you’re thirsty. Drink plenty of fluids throughout the day to stay hydrated. If enjoying alcoholic beverages, rotate between water and your favorite adult beverage. Sanitize – Bring along hand sanitizer and use frequently, especially right before you dig into that Take a Taco. Crowds and kids – Musikfest and crowds go hand-in-hand. Make sure young children are always in sight. Set a designated meeting spot in case anyone in your group gets lost. Sneakerize – Be sure to wear sneakers, walking shoes or other comfortable footwear. There’s a lot to see and do at Musikfest. Take care of your feet so you don’t miss a thing. Be heart aware – A study at Germany’s popular Oktoberfest celebration found drinking heavily over a short period of time can significantly boost the risk of an abnormal heart rhythm, even in healthy people. Always avoid binge drinking, especially in the heat. Downside to fried – It’s always fun to discover what new foods Musikfest vendors will dip in a deep fryer, but eating too much fatty or fried foods can cause diarrhea. Save your ears – And we’re not talking about an ear of Aw Shucks corn. Normal conversation occurs around 60 decibels, while a loud concert can register at almost 125 decibels. Eat to the beat – A common Musikfest misconception is that there is nothing healthy to eat, but that’s far from true. LVHN Healthplatz tip: Check out healthy Mediterranean options like Greek salad or grape leaves or snack on hummus and guac at one of the many food stands at Musikfest. Plan your healthy menu by reviewing the list of food vendors at Musikfest.org. Polka’d too much in the wrong shoes, missed the curb and twisted your ankle? 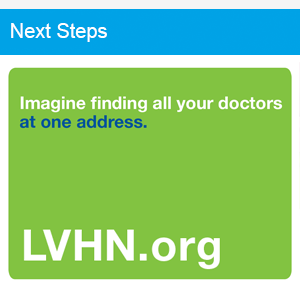 Lehigh Valley Health Network, official medical provider of Musikfest, is ready to help. Four staffed health tents, aptly named LVHN Healthplatz, can be found at Festplatz, Volksplatz, Experienceplatz and Sands Steel Stage. We treat minor injuries such as blisters, cuts, nosebleeds, sprains and burns, etc. Need a quick respite with your bundle of joy? Baby changing tables are at all LVHN Healthplatz locations (except Sands Steel Stage) and also at Familienplatz. Nursing moms can find a little solitude inside our tent at Experienceplatz. Stop by if you need medical help, or just to say hello and learn more about us.